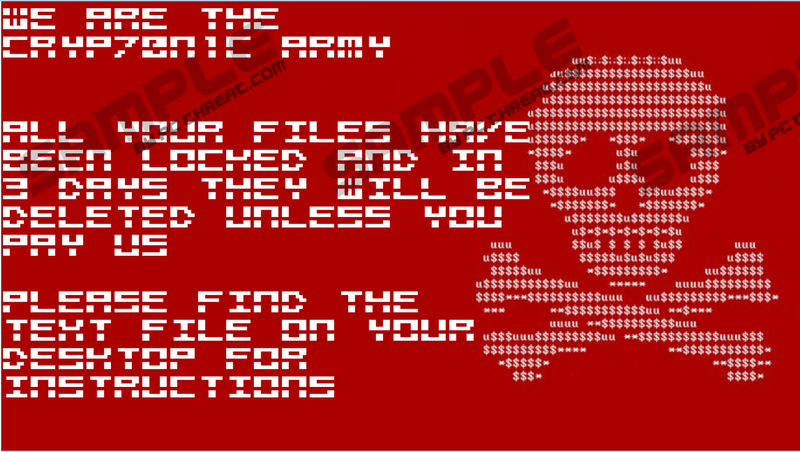 As soon as Cryp70n1c Ransomware slithers into your operating system and encrypts your files, it changes your Desktop wallpaper using the “ransom.jpg” file to introduce you to a scary image and an even scarier message. According to it, your personal files are locked and will be deleted in 3 days if you do not follow the instructions that are represented in a file on your Desktop. That is bound to catch your attention. Unfortunately, some users are likely to pay attention and do everything to decrypt their files, but that is not the way to go because the creator of this malicious threat is unlikely to make decryption possible regardless of what you do. Unfortunately, it appears that the only thing you can do in this situation is to remove Cryp70n1c Ransomware and then count your losses. Hopefully, you had your files backed up before the attack of the ransomware, and you will be able to restore them after you eliminate the threat. Maybe you are lucky, and none of your personal files are encrypted at all! Keep reading to learn all about this, as well as the malicious ransomware. Cryp70n1c Ransomware comes from the Hidden Tear family. Infections in this family – those include French Ransomware and Rastakhiz Ransomware – are built using the same open source code, but they all look different because they are built by different parties. So, how is this malware spread? Cyber criminals can use various security backdoors, but you have to be especially careful about spam emails because various ransomware threats are spread via files attached to them. Once the infection is executed, it immediately looks for files in these %USERPROFILE% folders: Contacts, Desktop, Documents, Downloads, Favorites, Links, Music, OneDrive, Pictures, Saved Games, Searches, and Videos. Cryp70n1c Ransomware specifically looks for files with such extension as .txt, .exe, .doc, .jpg, .pdf, .dll, .lnk, .mp3, or .mpg because they represent “personal” files. If files are encrypted, the “.cryp70n1c” extension is added to their original names, and that is how you can stop the corrupted files faster. Do not rush to remove the extensions or delete the ransomware itself because that will not help you. Unfortunately, the only solution that you have in this situation is offered by the creator of the malicious Cryp70n1c Ransomware. You can find it within the “READ_IT.txt” file on the Desktop, where it is suggested that if you send 0.05 Bitcoin to 1KDQcgujZKjMgZkYSbMJJpLeGSDqBwa1RM – which is a special Bitcoin Address – your files will be decrypted. It is unclear how exactly a decryptor would be offered to you because the email address mentioned in the ransom note – which is ransom@deliveryman.com – is meant to be used only for contacting cyber criminals. All in all, whether or not you pay the ransomware, and whether or not you email cyber crooks behind Cryp70n1c Ransomware, your files, most likely, will remain encrypted. Note that at the moment, 0.05 Bitcoin converts to around 650 US Dollars, and that is not the kind of sum you want to put on a line, especially when the chances are that you will lose it for no good reason anyway. All in all, even if by some miracle you manage to get your files decrypted, you cannot forget that you must delete the malicious threat. As you now know, Cryp70n1c Ransomware creates two files to represent the ransom demands, including the JPG and the TXT files. Besides that, this threat also copies itself to the %HOMEDRIVE%\user\Rand123 folder, as “local.exe”. Once the copy is made, the original launcher deletes itself, and so that is not something you need to worry about. Once you eliminate these ransomware components, it will be gone for good. If you need a step-by-step guide to remove Cryp70n1c Ransomware, you can find one below. Unfortunately, even successful elimination of this threat will not affect the encryption of files. If backups exist – and that truly is the only way to recover them – you are fine. If files are not backed up, make sure you fix this in the future. This ransomware is not the only threat out in the wild, and it certainly is not the scariest one. There are ransomware threats capable of paralyzing operating systems and even wiping data altogether. Therefore, besides protecting your files by backing them up, you also want to protect your operating system, and you can take care of that by installing anti-malware software. Move to the Desktop and Delete the file named READ_IT.txt. Delete the folder named user (it hosts the local.exe and ransom.jpg files within). Restore the preferred Desktop wallpaper. Install a malware scanner and scan your operating system to check if your PC is clean. Quick & tested solution for Cryp70n1c Ransomware removal.